Welcome to the family run Round Tower Hotel located in the beautiful village of Ardmore. 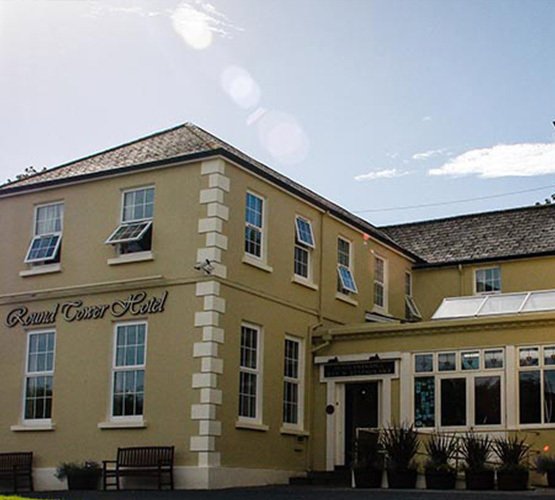 Round Tower Hotel is a Fáilte Ireland approved 3 star hotel. Nestled in the western end of county Waterford in Ireland's acclaimed 'Sunny South East', the hotel offers guests and visitors the opportunity to enjoy their break in one of Ireland's oldest Christian settlement villages. Check out our activities and gallery tabs to see what Ardmore has to offer. The Round Tower Hotel core building was built in the 1920s as accommodation for the Irish College adjoining (now a private house). Ardmore, at that time, was an official Gaeltacht (Gaelic speaking) area. See the 1950s black and white photo in our Gallery page of the Irish College and dormitory accommodation (now our hotel). In later years the Department of Education sold the building to the Sisters of Mercy order of nuns in Dungarvan for the purpose of a summer retreat house. The Sisters of Mercy sold the building in 1989 to a local family who converted it into a hotel. Several building extensions have been added including a car park. The main body of the old building encompasses the dining room and bar areas. Incidentally, the convent chapel was once located in the current dining room. The 12th Century Round Tower from which the hotel gets its name overlooks the hotel and the village of Ardmore like a watchtower, as it has done for almost one thousand years now. The old graveyard, multi-denominational, and Monastery which encircle Ardmore Round Tower are among the most photographed areas in the region and are a must see during your time here. Five minutes walk from the hotel is Ardmore Beach, a truly wonderful example of golden sand and cool Atlantic water for bathing. Ardmore Bay itself is a magnificent expanse of water which is ideal for sailing, kayaking or some casual fishing, it's horseshoe shape giving it a sense of enclosure and solitude. Skirting around the outlying coastal areas of the village is the world famous Ardmore Cliff Walk, extremely popular with visitors all year round and a daily walk for many residents of the village. Walkers tend to use the western end of the walk as a starting point, taking in the breathtaking coastline as they weave their way around Ram Head, ending up at St. Declan's Well and ruin at the eastern side. Exiting the walk one can take in the vast expanse of Ardmore Bay, a magical sight on the southern tip of Ireland. Come visit us here, you will not be disappointed. Round Tower Hotel is a family run 3 star hotel. The present proprietors are Aidan and Patricia Quirke. Aidan bought the hotel in January 1996. Aidan is a Shannon Hotel School graduate with almost thirty years experience in the hotel trade. Patricia is a University of Wales Business Studies graduate and a Project Manager with twenty years experience working with Global IT companies. Round Tower Hotel offers 10 well appointed en suite bedrooms with free Wifi, TV, phone and tea & coffee facilities. Bedrooms were fully refurbished during the winter season 2015/2016 and re-opened in March 2016. Hotel encompasses a dining/breakfast room (refurbished in 2013), small function room, traditional Irish bar and residents lounge. Fresh local produce features prominently on both the bar and restaurant menus. Bar food is available during the summer season from June to September normally and our traditional Sunday Lunch menu is served all year round. There is free hotel car parking suitable for guest vehicles and bus/coach drivers. In the summer months the hotel garden is available for bar food & drinks and is child friendly. Every Sunday evening during the summer there is a live music gig in the garden, this has proven very popular over the years for families to enjoy. The hotel also has a live music session on the last Friday of every month all year round. This is enjoyed by both visitors and locals alike. The hotel has hosted many headline acts in the past, notably Irish artists: Eleanor Mc Evoy, Gemma Hayes, Eleanor Shanley, John Spillane, Liam Reilly, Mike Hanrahan, Roy Buckley and George Murphy. Round Tower Hotel caters for all family events, BBQs and private functions throughout the year - advance booking essential. Meeting room facilities are also available at the hotel, again advance booking is essential.